Update (June 2014): Things have changed in the 3 years since this post was published. After emphatically stating I wouldn’t write another how-to book, I surprised myself this past year by working on Felt Wee Folk: New Adventures, which will be released by C&T in the spring of 2015. Read posts about it here. These animals will not be included in the new book, but there will be lots of other fun dolls to make. 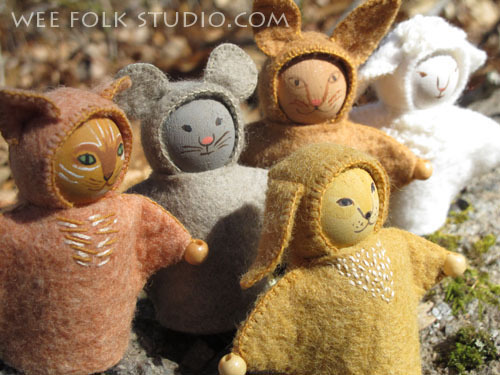 I made this group of animals about 10 years ago, when I was gathering ideas for my how-to book, Felt Wee Folk. They didn’t make the book’s cast, so the little critters have been waiting behind the curtain ever since. I’ve pretty much decided not to write another instructional book (read ahead for more on that), so they can come out on stage, now. They are made with wooden forms that have a simple dowel on the bottom, with a turned ball on the top. You can find the wood shapes here. At about 2 inches tall and similar to finger puppets, these can stand up by themselves. The small wooden bead “paws” are a choking hazard, so they shouldn’t be added if a young child plays with them. They look a bit like Halloween trick or treaters in felt costumes, with their hoods and painted faces. 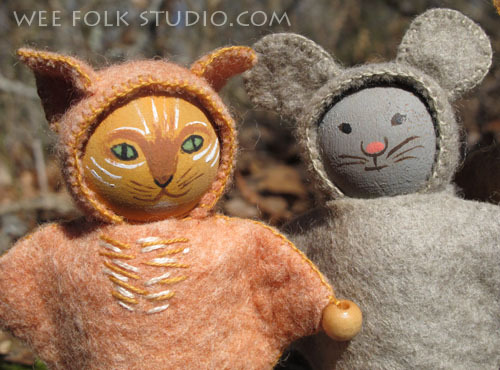 It’s so wonderful to hear from readers who have enjoyed making the dolls and other projects in Felt Wee Folk and many have urged me to write another instructional book. The publisher is willing, too. So why can’t I say yes? I am clearly ambivalent, because I had a great experience working with C&T Publishing. It’s just that I’ve moved on to other things and don’t feel the same push to get it out of my system, like I did 10 years ago. It’s not that I don’t have any ideas for new projects, they’re just more complicated and personal. I’m resisting the pull to work on another book because I want to spend time exploring new ways of working, to experiment and grow as an artist. Just the process of formulating my thoughts for this post has helped me understand why I’ve been dragging my feet. The trouble is, I know what it takes to produce an instructional book and I also know that I’m not up to it. It’s writing out those pesky directions that has me stumped. When I approached C&T with my proposal for Felt Wee Folk. I had a strong desire to share my ideas, enough to force myself through the quagmire of analysis and explanation. I’ve always had a problem with describing how to make what I do, even back in the days when I designed projects for Better Homes and Gardens. I know that I can do it, but I can’t bring myself to jump down that rabbit hole. I want to give myself over to the mysterious process of creating something without later having to give a detailed description of how I made it. So, I’ll be sharing projects and ideas from time to time, but without patterns and instructions. Hopefully, my readers will feel inspired enough to want to try a hand at figuring out how to make something of their own! This entry was posted in Animals, Dolls, Felt, Felt Wee Folk, my design productions by Salley Mavor. Bookmark the permalink. You are so talented. I love every thing you do….wish I had the knowledge and whimsy you have……Great work. Salley, I have received endless pleasure from your book “Felt Wee Folk;” no small part of which is the wonderful photo’s in the book. Your instructions made making the Folk very enjoyable. I do understand the joy of making without explaining, though. Whatever you choose, you will continue to inspire. You should never feel compelled to do something. That is when it ceases to feel creative…..go whatever direction calls to you! You belong to yourself as an artist, never the public! Can’t say I’m not disappointed, I adore your Wee Felt Folk book, however that being said I totally understand your desire to simply be creative and not have to explain the process. You will continue to inspire me and I can’t wait to share the journey. You are always so generous in letting us all into your wonderful world. these critters are just as sweet as can be!! you certainly shared enough information here on how to make them…thank you for that! knowing there will not ever be another one, i will continue to treasure Felt Wee Folk…i still enjoy going back to those projects as much now as I did when it was first published. I’m probably not the only one who would love seeing the projects you made for BH&G…any chance you still have back issues on hand? I’m so glad I got the book! I know how you feel about having to put in detailed instructions–I’ve always done much of my art and crafting intuitively and when I was younger, I couldn’t understand how people could not “just do” whatever it was I was doing. I thought figuring out how to make things came naturally to everyone. I had to learn to “deconstruct” so I could teach whoever was interested and to share the joy that comes with making things with our own hands. Thank you Salley, for taking the time to share your knowledge and your beautiful works of art with us! Salley, I can truly say that I have used your book more than any other instruction book that I own. I didn’t copy your designs, but used them as a springboard to my own “folks”. I am so grateful that you were willing to create that nice book! Further, it is wonderful that you share your ideas with us on your web site! I do understand your reticence in spending time making another instruction book. I have been asked, many times, to teach painting classes, or make instructional patterns. When I consider all the changes I have made, while painting a project, my face goes pale at the thought of trying to recall what I really did during the process. One only has so many hours to work, each day. The act of creating, along with the subsequent changes that occur, are so very exciting and rewarding! I vote for that feeling!!! Enjoy, Salley!!! And, a big PS: I loved getting to see these adorable animals!!!!! The standing animals are SO cute! I love the last paragraph of this post. Your Felt Wee Folk book is a favorite of mine, but aside from bending my pipecleaners over your pattern, I do everything else my own way. Your art is inspiring that way. It’s all YOURS, yet it makes me want to create entire towns of felt-wearing pipecleaner people for no other apparent reason than that I ENJOY doing so. It sounds like you’ve made a wise decision. To be able to grow as an artist means change and taking chances. The animals are adorable. I really understand your not wanting to go through the process of writing another book, but, must admit, I have always hoped you would. I would love to know about making the detailed hands with fingers, making the birds, shoes, hats, etc. I will look forward to the instructions you post. These animals are adorable! Your instructional book has provided endless pleasure–not to mention income–for so many people. It is a classic for sure. Thanks for sharing these little animals…their faces are so sweet! What fun to think of what you might want to do next! As always, I love seeing your embroidery and hope you will show more of your exceptional needlework, too, in the future. Good for you to *go with your heart*! And how timely this post is, I was trying to remember a site that sold those wooden peg *people* and other parts. Your animals are absolutely adorable and you have inspired me to go forth and make some for the children. Sending good wishes as you continue on your journey ! And can’t wait to read about more projects! I love all your work and so appreciate your willingness to share it. Looking at your blog is always like getting a shot of creativity. When you were making your kits for your wee folk, they were so incredibly loved at my toy store. Your book continues to be a source of delight, but so many people feel unsure of the skills without a kit. Would you consider letting someone else make kits and instruction sets for some of your amazing projects? Sarah, I agree that many people feel more confident with a kit. I know that I could license my fairy kit designs, but I’m not interested in putting the time into researching and overseeing something like that. Thanks for the suggestion, though. 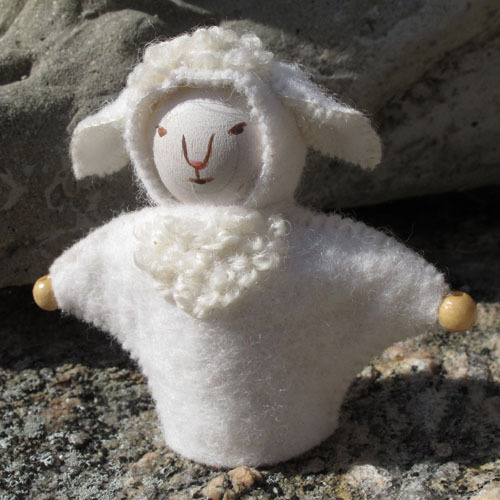 I love these darling critters…so charming and puppet-like. I completely understand your decision regarding compiling another book right now. You need to listen to your “inner voice” and make the best choice for you right now. It certainly will make us treasure “Wee Folks” even more…if that’s possible! Blessings and peace to you…and keep blogging. These interaction times are valuable and inspiring. Thanks for all you do! Your blog is wonderful for inspiration! I do have your book and I love it, but I don’t blame you for liking the creative process more. Just keep showing us your wonderful creations and we’ll take it from there! I’m looking forward to the evolution of your art, just imagine what is yet to come! Oh Salley! These are adorable! I love them and my grandbaby Charlotte who wanted Felt Wee Folk Jack and Jill for Christmas will go ga-ga over the animals. The list of “I want to make that” grows ever longer. I understand the frustration of choosing what to do next and where to invest the creativity and energy. Rabitat is fabulous. Can’t wait to see some more. I just love these animals! Salley, I really appreciated reading your post. Your words gave me much needed inspiration. 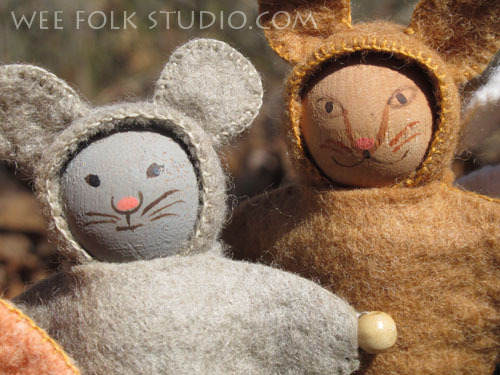 I’m in the midst of making kits and writing how-to books on needle felting. Having a business based upon something you love is a great challenge. I’m so glad you are able to preserve your creative desires and move forward. ps. Congrats again on the Golden Kite! I’m a SCBWI member, too! Darling Animals!! I think I found the project to keep my hands busy next winter during the bad weather! They will keep my flower fairies company in their fairy house. You have such a gift, one that continues to delight with your creativity!